When you begin a lengthy activity, project or season, you’re on the runway ready to take off. You’ve got energy, focus and resolve. A smooth ride and safe landing are your goals. You aren’t even thinking about running out of runway when landing. But what do you do when you’re at the end and you’ve run out of time? Whether it’s due to an overwhelming workload, unexpected complications or just plain procrastination, you have no more runway to land and you’re about to crash. Now what? This is a terrible place to be. The stress can be ridiculous, affecting your physical, emotional and mental well-being. The more you think about it, the more stressed you become, sometimes to the point of panic. Your heart races and you can’t think clearly. Ughhh. Whenever your mind goes into frantic overdrive, you’re in a bad place. Don’t waste your time analyzing why you’re in the condition you’re in. Avoid blaming others, circumstances or yourself. It is of no value now. In fact, it’s actually detrimental. Instead, you should evaluate the work you have to determine what is most important and how much time you will devote to each item. Mentally, your focus will be on the task at hand and you will be able to concentrate on it. Resist “thought-creep,” like peeking at the pile yet to do. It will only send you into panic mode again. After your allotted time, put a bow on it and go to the next priority. If you do this, you will be able to apply yourself to the work that has the most impact. 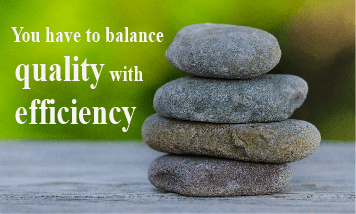 Remember, you have to balance quality with efficiency, so take the time you need to get it right the first go-round, but no more. You have only so much runway and only so much energy. Getting through crunch times is a natural part of the profession. If you learn how to manage yourself and the work, you will fare better, be successful and enjoy our career. It’s all about not running out of runway.